Influencer Audience Insights are an important type of data — part of an influencer’s 360 footprint — that describes the demographic and psychographic characteristics of an influencer’s audience, giving you a comprehensive picture of who they reach. Influencer marketing can achieve the highest level of success when marketers have the greatest ability to reach relevant audiences and impact the customer journey. Audience Insights help better align your influencer marketing goals with the results influencers can produce. Improved targeting — Understand who your prospective influencers are talking to and if their audience is aligned with your ideal customer. Marketing alignment — Align your influencer program with marketing segmentation across all your marketing activities. Audience affinity — Find and group influencers based on audience affinity in an effortless way. Where can I find Audience Insights in Traackr? Audience Insights appear on the influencer profile for any influencer who has been added to your account and projects. 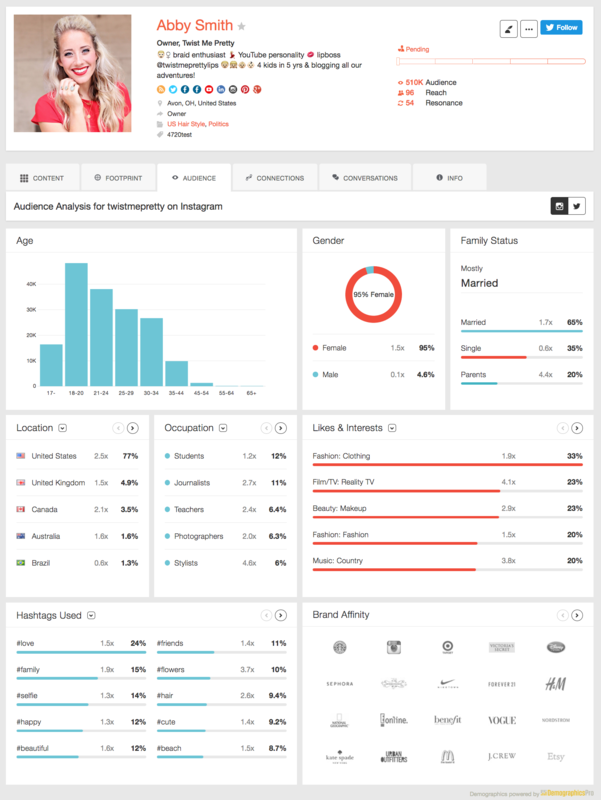 To view Audience Insights, go the influencer’s profile and select the Audience tab. What type of information is available in Audience Insights? The following information about an influencer’s audience is available on their profile. For each category, you can see the top 20 items, by frequency or affinity. Frequency is the percentage of the audience matching a specific criteria, for example living in France. Affinity is the ratio to the baseline value (average). For example, 1.3% of Instagram users (worldwide) are Stylists. If an influencer has 13% stylists in their audience, this is 10 times the baseline. The higher the ratio, the more affinity has the audience with that criteria. Frequency and affinity provide complementary pictures: While frequency is more about audience shares, high affinity values may surface niche aspects that are very strong in the audience of an influencer. Influencers with over 2K Twitter and/or Instagram followers will have Audience Insights. Their profile will surface an audience analysis for each public social channel. For newly uploaded influencers, it might take up to 48 hours before Audience Insights will become available. Audience Insights are available for people, but not entities. Traackr’s Audience Insights are powered by data from DemographicsPro, a Traackr partner and the leader in the audience analysis space. DemographicsPro uses a data-centric methodology, filtering and amplifying multiple signals using large, proprietary knowledge bases of established correlations, then combining these via a series of algorithms to make specific demographic predictions. Audience Insights are available for customers subscribed to the Enterprise Premium plan. To learn more about Audience Insights data, contact us.